Climbing the scaffolding of success. 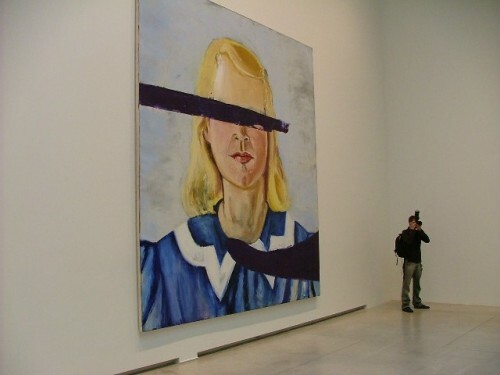 Julian Schnabel has his first museum show in years. What she can’t see won’t hurt her. The work is on view in Toronto. 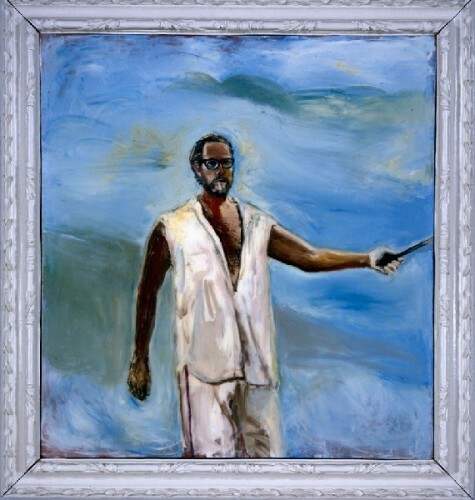 It is somewhat ironic that Julian Schnabel’s current exhibition, Julian Schnabel: Art and Film, at the Art Gallery of Ontario, Toronto’s version of New York City’s MoMA, is following in the footsteps of the museum’s King Tut exhibition. Both men are famous for doing things in a very big way, King Tut with his tomb, and Schnabel, highly in evidence here, with his titanic canvases that all but dwarf the common man. For the fifty-nine year old Schnabel, who was all the rage with his smashed plate paintings during the late '70s and early '80s, before he fell off his art world pedestal, this exhibition – the largest since his 1987 Whitney Museum Retrospective – is tantamount to a Second Coming. The “ball has come back into his court” as he gratefully acknowledged during his press preview. Not that he ever stropped playing, or for that matter stopped painting, but people and life went on to different things. Julian himself turned to film directing, a move which further eclipsed his reputation as a painter. Art and Film, deftly curated by David Moos, is an ingenious way of refurbishing Schnabel’s all but forgotten art world reputation while reintroducing him to the general public who is more familiar with the films than his art. The exhibition, using some sixty of Schnabel’s works, dating from his 1975 painting Norma (Pool Painting for Norma Desmond), a tribute to the film Sunset Boulevard, to the present, traces the artist’s interest in cinema through his paintings, sculptures, and photographs. Many refer directly to specific actors, filmmakers and their films, such as Pasolini’s Accattone and Vittorio de Sica’s Shoeshine. Strangely. the exhibition, despite the immense size of some of the canvases which takes up the entire 5th floor of the museum – because of the intensely personal and arcane nature of many of the works – is an intimate experience. Crowds aside, the viewer is continually reminded, by the size, power, and experimental brashness of the artist’s executions, that there are only three people here to take into consideration—you, the looming art works themselves, and the branded hand of Schnabe. The resonance of its signature announces itself at every turn. 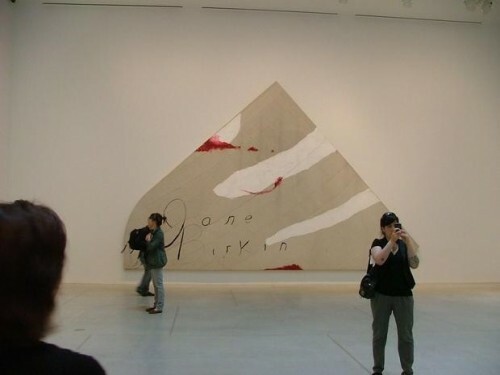 The first painting that meets you head on is the Last Dairy Entry (for Roman Polanski) 2010. Though I do not presume to know what it is about, nor what it represents. The lush and crazily colored figure in the painting, a mix between a tampered down Frances Bacon, an Alice in Wonderland character, and some dizzy dame, is exciting and very much alive. It is one of the few works in the exhibition that jumps out at you. 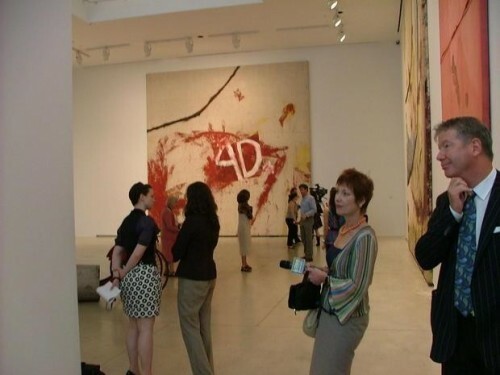 It actively grabs your attention, rather than engulfing or attempting to overwhelm you, as many of his larger works do. Though a couple of Schnabel’s historical smashed plate paintings are on view, most prominently his groundbreaking 1978, Patients and the Doctors, having settled back into the dust bin of history, they bear none of the initial excitement that they engendered when they first turned the art world on its head. At least for now, until they are gathered en masse for maximum effect– and hopefully this will be soon – they remain an anachronistic oddity. Equally unengaging, though it does shed light on the artist’s respect for Brando who he considers “the greatest actor that we’ve seen” – is the Brando Room, where six large, relatively mundane poster-like photographs. Schnabel bough them from the actor’s estate sale,. They depict him in a long-haired wig, kidding around during the filming of the 1968 comedy Candy. By adding spray paint, resin, and ink onto the surface of these photographs, Schnabel, making this work his own, transformed the photographs into paintings. These same photographs first appeared during a fantasy scene in Schnabel’s 2007 film, The Diving Bell and the Butterfly. Another small gallery is filled with portraits that Schnabel has painted, including one of himself that reads “from the collection of Johnny Depp.” Even with their tacky framing, which reads young and very early '80s, the slickly painted, slightly garish portraits, compelling in a nervous sort of way, are not half bad. Gary Oldman, who as Albert Milo played Schnabel in his film Basquiat is presented wearing a traje de luces (suit of lights) that belongs to Curro Romero the famous Spanish bullfighter. Rula Jabreal, Schnabel’s current love interest, and the author of the book on which Schnabel’s soon to be released movie Miral is based onopens worldwide this December. She is seen wearing the same dress that Emma de Caunes wore in The Diving Bell and the Butterfly during one of Jean-Dominique Bauby’s reveries. The most compelling portrait on view is the 1982 The Portrait of Andy Warhol painted on black velvet, in two sittings and 5 hours. Here a shirtless, ghostly Warhol, looking more vulnerable than usual, more an apparition than a live human being, appears to be dematerializing before our very eyes. The most cinematically stunning works on view is Painting for Malik Joyeux and Bernardo Bertolucci V and VI, two enormous black and white photographs, from Schnabel’s 2006 Surfing series. 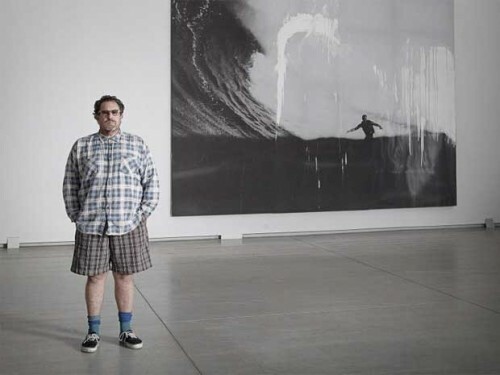 Again, by adding gesso and ink to the polyester canvas, the artist turns a simple photograph of a surfer negotiating a giant rolling wave – somewhat akin to turning a script into a movie – into a breathtakingly dizzying ride, which all but magically pulls us into a canvas that is more alive than dead. Not a bad ending for a Schnabel comeback.